Target Mode Imaging (TMI) allows you to image multiple computers subsequently by connecting them to a host computer using a FireWire, Thunderbolt, or USB-C cable. This can be ideal when using a network connection is not optimal or supported. To use TMI, you run Jamf Imaging on a host computer. Then, you boot the computers being imaged (target computers) to target disk mode and connect them to the host computer. Note: It is recommended that you use a dedicated host computer for TMI. Note: While you can use a file share distribution point on the network, it is recommended that you use a local distribution point for optimal data transfer speeds. 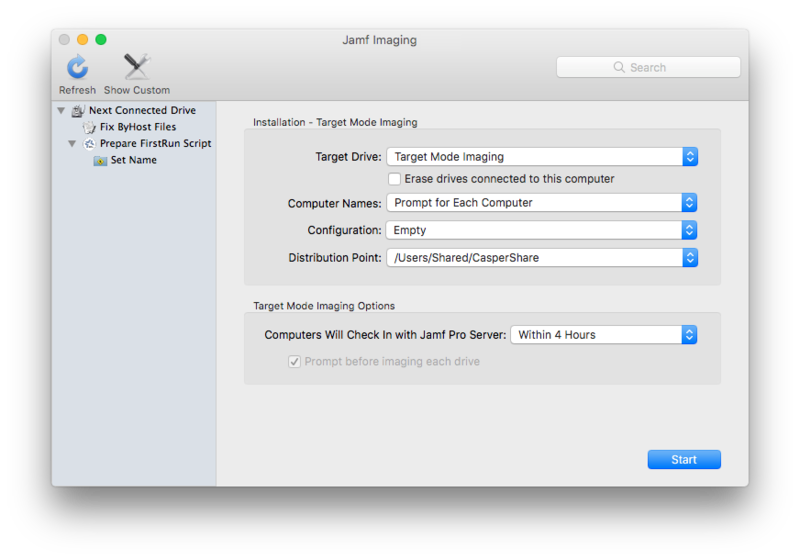 For more information, see the "Target Mode Imaging" section in the Imaging Mac Computers with Jamf Pro technical paper. On the host computer, open Jamf Imaging and authenticate locally. Choose "Target Mode Imaging" from the Target Drive pop-up menu. To erase each target drive before it is imaged, select the Erase drives connected to this computer checkbox. To be prompted to manually enter a name for each computer, choose "Prompt for Each Computer". To automatically generate names in numerical order, choose "Use Numerical Order". Then enter a starting number, and a prefix and suffix as needed, and click OK.
To use each computer's MAC Address as the name, choose "Use MAC Address". Then enter a prefix and suffix for the MAC Address as needed and click OK.
To use each computer's serial number as the name, choose "Use Serial Number". Then enter a prefix and suffix for the serial number as needed and click OK.
To assign names based on the contents of a CSV file, choose "Upload CSV File" and upload the file. For more information on using a CSV file to assign computer names, see the Creating a CSV file to Assign Computer Names During Target Mode Imaging Knowledge Base article. From Computers Will Check In with Jamf Pro pop-up menu, choose the approximate amount of time until computers will check in with Jamf Pro. Important: Computers that do not check in within the specified amount of time will not be enrolled with Jamf Pro. To bypass the prompt displayed before imaging each computer, deselect the Prompt before imaging each drive checkbox. Boot a target computer to target disk mode. To do this, turn on the computer and immediately press and hold down the T key. Use a FireWire or Thunderbolt cable to connect the target computer to the host computer, and then click OK if prompted. The imaging process starts immediately. When the imaging process is complete, disconnect the target computer. Repeat steps 13–15 for each target computer.